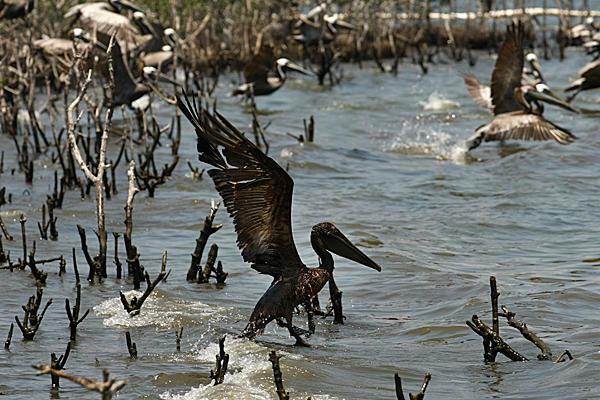 An oil soaked brown pelican attempts to takes flight on Louisiana coast. Photo by Gerald Herbert / AP. Shock and awe, misdirection, the whole truth turned upside down? Could it be that the obscenity-driven confrontation between Plaquemines Parish President Billy Nungesser and Louisiana Governor Bobby Jindal was a more exact replica of oil war shock tactics than I thought? Kirk James Murphy, MD, argues in the firedoglake blog that the sand-barrier plan to block the oil slick on the Louisiana coast is being pushed to completion by interests who would rather be rid of the marshlands than save them. Is our grief over the deathwatch at the Gulf Coast being crassly manipulated for the purposes of real estate development? Dr. Murphy’s blog-post quotes at length a May 8 report by Josh Wingrove of the News and Mail, pointing out that the barrier-island plan has been three years in the making. What wrenched our hearts out this week was the CNN presentation of Anderson Cooper’s visit to a dead marshland, recently killed off by a gooey assault of crude oil. Not even the bugs had survived, we were shown. Nungesser pleaded for immediate action. James Carville bore witness to the fact that nothing was being done anywhere in sight. Jindal and Nungesser have been arguing that barrier berms would stop oil from reaching more marshland. And their arguments make obvious sense under the circumstances. The CNN media campaign this week has the shocking effects that we remember from oil wars past. And the effects are especially felt among those of us who like Louisiana Congressman Charlie Melancon find it difficult not to cry at the sight of our dying Gulf. And there is no doubt that our shock is being played like a football on its way to one goal line or the other. But why does Dr. Murphy opine that the berms probably won’t survive the hurricane season, while he argues that they would dry out the marshes? And what good are wetlands anyway once they have been covered by bubbling crude? Dr. Murphy’s argument would place our shocked grief in alliance with the Corps of Engineers, who apparently resisted the berm idea until CNN tossed Nungesser a lateral pass this week. Given the velocities of these shock tactics, there is never very much time to decide things. And maybe the velocity alone is enough to raise suspicion. Except. Except in this case there actually is an enemy attacking the marshlands, and Nungesser appeared to be making his arguments in the company of lots of people. The image of Nungesser in a crowded room makes it more difficult to believe that his plan runs counter to the interests of people who live along the marshlands and who are working up a campaign of self-defense. But this is the way shock psychology would work with the power of images. It’s also curious that the Corps of Engineers is not more forthcoming for the cameras. Nungesser does make a point when he asks: where’s the plan? And compared with the images of oily death in the marshes, it would seem that the risk of drying wetlands is less inhumane to the doomed creatures of the Gulf. Once upon a time I walked to work through those coastal marshlands on my way to an offshore drilling job. On the Gulf Coast, from Corpus Christi to New Orleans, there is no such thing as a non-toxic option. 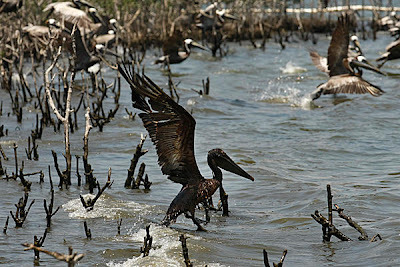 Marshland protection is one of at least three scientific issues that are being fought on the fly during this oil spill. Thursday evening brings news of an “oil plume” that is about 1,000 yards deep and six miles wide drifting in the direction of Mobile Bay, Alabama. Reports say the plume is a toxic cocktail of dispersants and oil. Is it better or worse than an oil slick? Oil slicks either repel life or kill it. Plumes, apparently, allow life but at the cost of a living toxicity that will work its way up the food chain. Cancer clinics for everyone. When CNN flashes pictures of the oil operation, there is a ship spraying cascades of fluids onto the water. Is this the dispersant? Here and there we see comments from scientists saying that nobody knows if the dispersant is such a good idea. Is it better or worse than a slick of thick crude? LIke Nungesser’s berms, dispersants also raise questions of money trails. The third scientific issue of course is how to plug the hole. Speaking on Larry King Live, the legendary oilman T. Boone Pickens says either you get lucky or you drill a relief well. August is the frequently cited expectation for when the relief well will be completed. “We’ve been here 38 days,” said Pickens, “and we’ll probably be here 38 days more.” If Pickens is right, will it be possible to stop the oil from washing ashore? They say the first stage of grief is denial, and I don’t want to believe that any of this is happening. What Congressman Melancon did in public yesterday, we have been doing in our homes this week all along the Gulf Coast. You cannot love the Gulf Coast, witness this shocking trauma, and control your tears at the same time.